Lucy, aka Pin Oak Lucy, is a white 5-year-old female with a little dark brindle marking on both ears and her right eye. Lucy was born November 5, 1997. 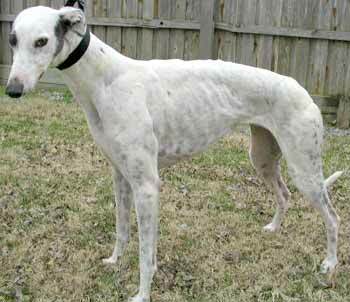 Her last race was January 10, 2003, in Corpus Christi, and she is ready to find her forever home and couch. 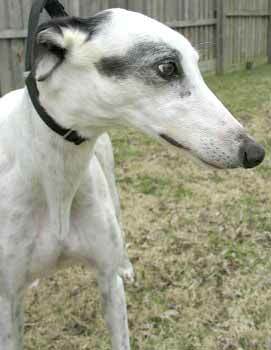 Lucy's temperament is sweet, and she is affectionate and loving. Lucy's personality has alpha tendencies, so she will do best as either the lead dog or only dog. It has not been determined at this time if Lucy is small animal or cat tolerant.